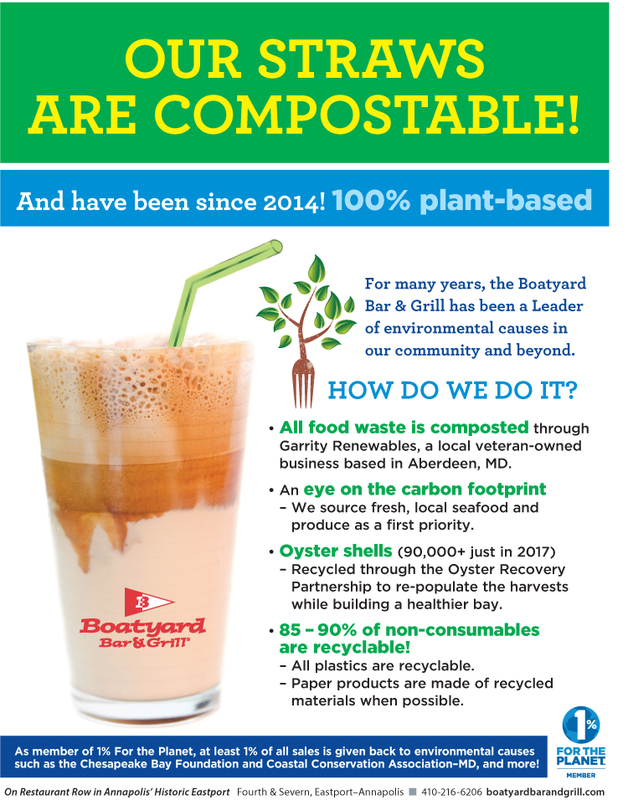 In keeping with the Boatyard's commitment to a healthier environment, our straws are 100% plant based and completely compostable......since 2014! Veteran Compost began composting our food waste in 2013 (now that is an incredible process!). Not long after, Justen let us know that the beautiful Boatyard red straws were getting into the scraps and messing with the machinery. Turning tail on our environmental pledge was not an option so we sourced a completely compostable green one. Companies are increasingly leaning toward more eco-friendly products and fortunately the price has come way down, allowing smaller venues to participate too. It's kind of cool that every step in the right direction creates a ripple of positive change! Not wanting a straw with your beverage? Please let our servers know! We are happy to comply. Voted Best Raw Bar by What's Up Best of Annapolis 2018, we sell a whole lot oysters here at the Boatyard.